Is there a simple way to flatten a list of iterables with a list comprehension, or failing that, what would you all consider to be the best way to flatten a shallow list like this, balancing performance and readability? But this method is fairly unreadable because I need that list(x) call there because x is a Django QuerySet object. Thanks to everyone who contributed to this question. Here is a summary of what I learned. I'm also making this a community wiki in case others want to add to or correct these observations. If you're just looking to iterate over a flattened version of the data structure and don't need an indexable sequence, consider itertools.chain and company. It will work on anything that's iterable, which should include Django's iterable QuerySets, which it appears that you're using in the question. Edit: This is probably as good as a reduce anyway, because reduce will have the same overhead copying the items into the list that's being extended. chain will only incur this (same) overhead if you run list(chain) at the end. Meta-Edit: Actually, it's less overhead than the question's proposed solution, because you throw away the temporary lists you create when you extend the original with the temporary. Edit: As J.F. Sebastian says itertools.chain.from_iterable avoids the unpacking and you should use that to avoid * magic, but the timeit app shows negligible performance difference. You almost have it! The way to do nested list comprehensions is to put the for statements in the same order as they would go in regular nested for statements. @S.Lott: You inspired me to write a timeit app. 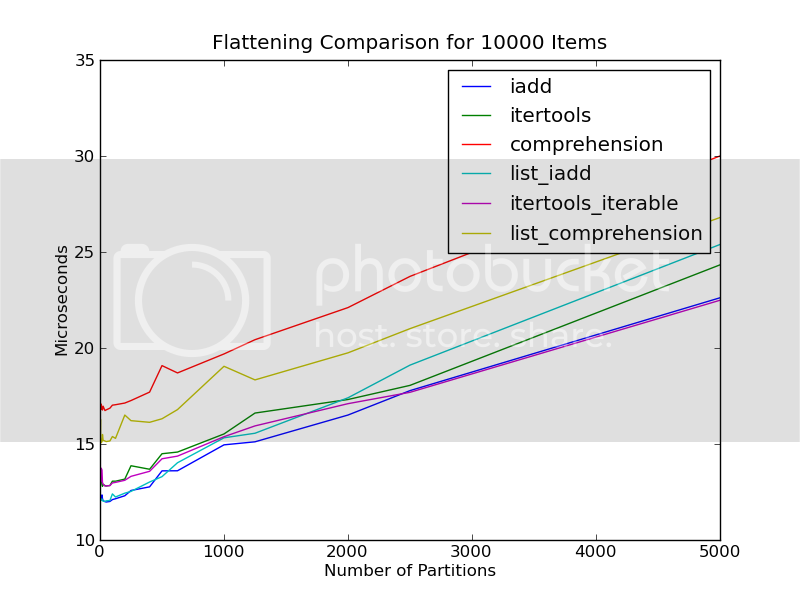 I figured it would also vary based on the number of partitions (number of iterators within the container list) -- your comment didn't mention how many partitions there were of the thirty items. 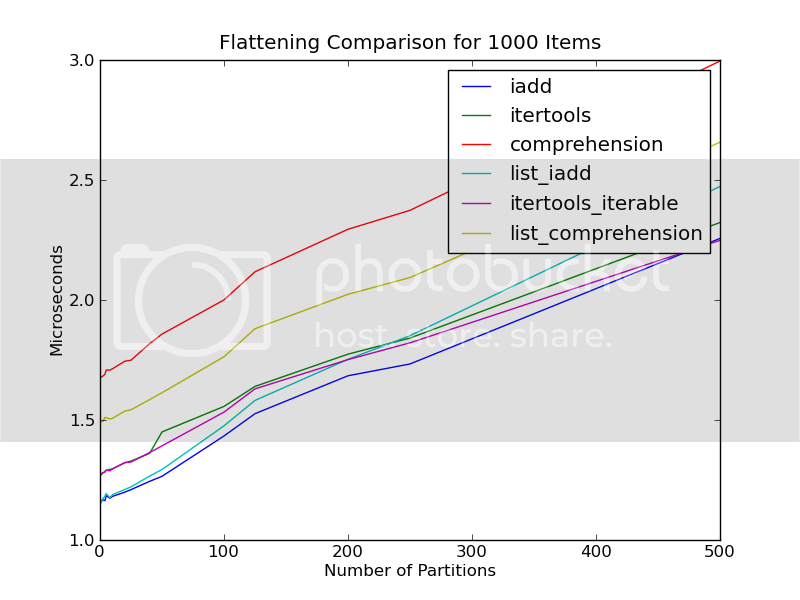 This plot is flattening a thousand items in every run, with varying number of partitions. The items are evenly distributed among the partitions. """Make sure all methods produce an equivalent value. :raise AssertionError: On any non-equivalent value.""" """Run flatten methods on a list of :param:`partition_count` iterables. Normalize results over :param:`test_count` runs. :return: Mapping from method to (normalized) microseconds per pass. Edit: Decided to make it community wiki. Note: METHODS should probably be accumulated with a decorator, but I figure it'd be easier for people to read this way. sum(list_of_lists, ) would flatten it. It avoids creating of intermediate list. Reduce is always a poor choice. There seems to be a confusion with operator.add! When you add two lists together, the correct term for that is concat, not add. operator.concat is what you need to use. Aha, you get back a list. from_iterable is pretty fast! But it's no comparison to reduce with concat. In either case, the gotcha was the nesting of the for loops. have you tried flatten? 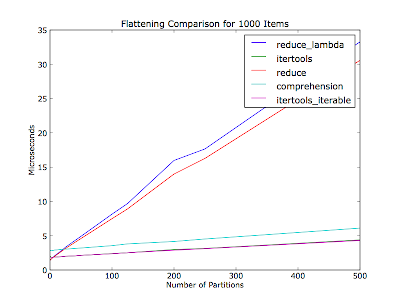 From matplotlib.cbook.flatten(seq, scalarp=) ? So to test how effective it is when recursive gets deeper: How much deeper? This version is a generator.Tweak it if you want a list. But, Guido is recommending against performing too much in a single line of code since it reduces readability. There is minimal, if any, performance gain by performing what you want in a single line vs. multiple lines. It will return a generator object which you can convert to a list with list() function. Notice that yield from syntax is available starting from python3.3, but you can use explicit iteration instead. The above code converts in_list into a string, uses the regex to find all the substrings within quotes (i.e. each item of the list) and spits them out as a list. The easiest way to achieve this in either Python 2 or 3 is to use the morph library using pip install morph. Not the answer you're looking for? Browse other questions tagged python list-comprehension or ask your own question. How do I convert a tuple of tuples to a one-dimensional list using list comprehension? What is the fastest way to flatten arbitrarily nested lists in Python? how to flatten a 2D list to 1D without using numpy? How do I flatten a list of lists/nested lists? How do I convert multiple lists inside a list using Python?